Greetings, foodie fans! I have a rather short and simple recipe to share with you courtesy of the new kitchen gadget I’ve acquired. Last July I added an airfryer to my Amazon wish-list. The one I really wanted was the Tefal Actifry and after reading countless reviews, asking about it on Twitter AND waiting patiently for the price to drop, I ordered one last week. I’ve been craving home-made chips for so long and used to own a deep fat fryer but those things A) waste a lot of oil and B) block your arteries. The airfryer is a healthy and economical way to cook food without the guilt. Well the first thing I had to make were chips. My first attempt turned out pretty good (if I may say so myself!) and I totally winged it by adding a couple of flavoursome ingredients. An airfryer does not make chips crisp (which I am not fussed about), but they cook wonderfully well and taste great. I can’t get over how little oil was needed to cook these! 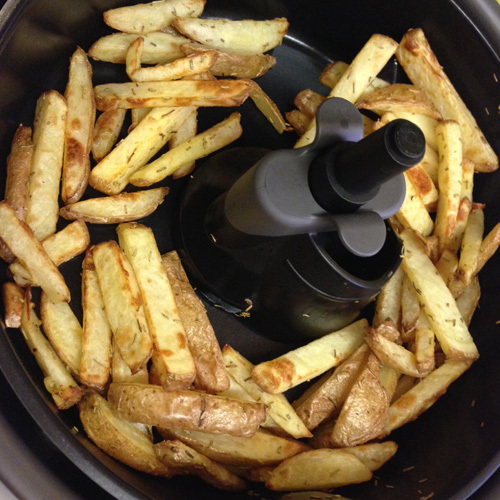 Here’s how I made chips with rosemary and fresh garlic in the Actifry. Dead easy – the appliance does all the hard work. 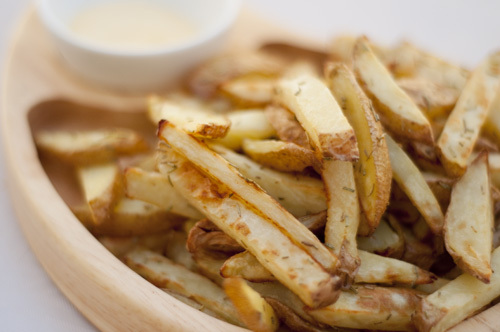 Cut the potatoes into chips, roughly 8-10mm thick. Wash and dry the potatoes thoroughly. I used baking potatoes but you can use Maris Piper for example, which is excellent for chipping. Serve with a condiment of your choice and enjoy!